Many companies realize the value of hiring veterans but are left wondering why veterans aren't applying to their company. When it comes to recruiting veterans, a one-size-fits-all approach is not a good idea. Recruiting methods need to be targeted and appropriate. Falling into the trap of one of the six big mistakes can cost a company a talented new employee. 1. Your Careers website is not veteran-friendly. A generic Careers website doesn't speak to veterans, since many are coming straight out of the military. In fact, veterans come from a unique situation with a variety of skill sets and expectations. It is important to highlight the veteran culture at your company in a way that validates your veteran preference. Examples include listing press releases of your work with veterans, Veteran Spotlights, Partnerships Awards / recognition, and military-friendly HR policies. 4. Your hiring message is not appropriately targeted to veterans. When issuing messaging about hiring veterans, it is important to provide quantifiable evidence giving the number of veterans hired and giving legitimacy to their efforts through lists of their veteran perks. Simply saying, “We’re hiring veterans,” is not enough. A better message would be: Company XYZ has committed to hiring 100 veterans for technical positions throughout 2015 and 2016. These six mistakes can easily stand between your company and hiring from the most talented labor pool this country has to offer. But they don’t have to. 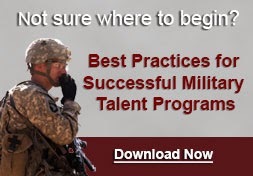 With a little research, effort, and teamwork, companies can highlight their military recruiting efforts in a way sure to attract qualified veteran candidates.